Excitement is in the air at the Four Points by Sheraton Orlando International Drive in the heart of Orlando. 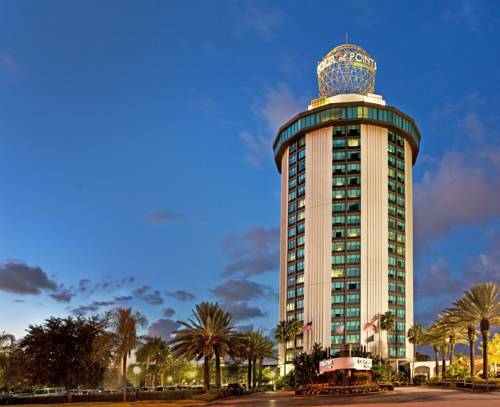 Located on world-famous International Drive, just across from Universal Orlando Resort youll find Orlandos collection of theme parks, attractions, restaurants, shopping, and the nation's second largest convention center just minutes away. Were the ideal Universal Partner Hotel.You will find as much excitement inside, too. Relax at the Tropical Breezes patio bar located next to our lush, tropical outdoor pool. Or retreat to one of our 301 contemporary guest rooms where you will find all the comforts of home. Our guest rooms feature views of Universal Orlando Resort, the downtown Orlando skyline, and International Drive.Expect star treatment and a flawless meeting experience that takes on a new flair. You'll find the perfect space for your needs with 6,500 square feet of contemporary flexible function space.Our knowledgeable and friendly staff will help you plan a great Orlando vacation at the Four Points by Sheraton Orlando International Drive. Located in the heart of Orlando, we are close to everything! From incredible restaurants and theme parks galore to lively nightlife, we promise something for everyone. Our knowledgeable and friendly staff will help you plan the perfect Orlando vacation! Come join us at Oasis Lounge and relax on your vacation. We cater to those rare non-sunny Florida days when the pool bar might be closed due to inclement weather. This outdoor bar and restaurant features poolside dining at lunch and dinner daily (weather permitting). Expect delightful service, appetizing meals, and an amazing atmosphere at Tropical Palms. For breakfast, choose from our buffet and la carte menu. Specialties from Florida and Latin America are served at dinner.